Frost can affect many plants, and is particularly damaging to tender new growth and blossom in the spring. 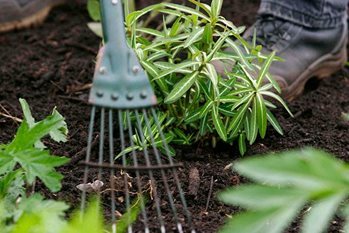 The risks of frost damage can be reduced by taking some simple steps to protect the plants in your garden. How do plants protect themselves from frost damage? Ground frost occurs when the temperature of the ground falls below freezing point (0ºC/32ºF) and air frost occurs when the temperature of the air falls below freezing point. Plant cells can be damaged or even destroyed by frost. Repeated freezing and thawing, or very rapid thawing can be particularly damaging to plants. Once the temperature has fallen below freezing, a strong wind can make a frost more damaging. Cold winds remove moisture from evergreen foliage more quickly than it can be replenished by the roots; this can cause leaf browning particularly at the tips and margins. Tender plants survive the winter better when they are planted in a sheltered sunny position. This is because new wood is ripened by the sun accumulating more carbohydrates during the growing season, making it more frost resistant. Newly planted, young plants can be more susceptible to frost damage than fully established specimens. Cold air naturally flows downwards on sloping ground, collecting at the lowest point or against a barrier, this is known as a ‘frost pocket’. As most gardeners will testify, it is easy to be caught out by frost. And sometimes frost damage is simply unavoidable. When damaged has occurred, what should be done? Important: Do not automatically give up on a plant that has been frost damaged. Many plants can be surprisingly resilient and may well rejuvenate from dormant buds at or below soil level. This takes time so recovery may not be seen until early summer. If the plant is of high value or it is not essential to fill the gap, consider leaving the damaged plant in the ground until mid-summer. If no re-growth has appeared by then, replace the plant. Why has my tree or shrub died?